Does The Louisville Football Schedule Provide Time to Improve While Winning? Louisville football has played two games and they haven’t looked overly impressive to date. The 3rd & 4th quarters vs. Indiana State are the lone bright spots so far on the 2018 with Malik Cunningham leading the Cards to its only offensive points vs. the Sycamores. Dorian Etheridge, Cole Bentley, Mekhi Becton, Kemari Averett, Marcus Riley, Tutu Atwell, Dae Williams, Colin Wilson, Hassan Hall, Keion Wakefield, Jawon Pass, Malik Cunningham, Tabarius Peterson, Michael Boykin, Jared Goldwire, Dejmi Dumervil-Jean, Derek Dorsey, Jarrett Jackson, Malik Clark, CJ Avery, PJ Blue, Nick Okeke, Robert Hicks, Rodjay Burns, TreSean Smith, Chandler Jones and Marlon Character. Keith Brown, Michaelee Harris, Charles Gaines, Robert Clark, Teddy Bridgewater, Gerod Holliman, DeVante Parker, BJ Dubose, James Burgess, Andrew Johnson, Terell Floyd, Corvin Lamb, Calvin Pryor, Jermaine Reve, John Wallace, Lamar Atkins, Deiontrez Mount, Jake Smith, John Miller, Jamon Brown, Lorenzo Mauldin, DeAngelo Brown, Jamaine Brook & Sheldon Rankins. Also like 2012 the schedule avails itself for the team to get better and keep winning. Louisville Football in 2018 needs to get better QUICKLY in order for the Cards to seize any opportunity like the 2012 team did. Clearly starting against Alabama isn’t even close to starting against Kentucky. But, from here on out the Cards schedule does present some soft opponents while leading up to some of the more difficult contests they will face. The Hilltoppers haven’t looked good thus far. Granted losing to playoff contender Wisconsin isn’t anything to be ashamed of, losing at home to FCS after a 21-0 halftime lead is. The Cards should roll in this one, BUT, Louisville hasn’t looked good either. While this is a home game for the Cards I’m going to correlate this game to the 2012 road game vs. Florida International. The Cards were able to pull off a close one (28-21) in a game that everyone thought Louisville would dominate. Hopefully the Cards can win and learn lessons along the way. The Cavaliers lost this past week in Bloomington. We all have our opinions about Indiana Football around here and it is universally not good. Virginia has moved its game this week vs. Ohio to Nashville to avoid Hurricane Florence. We’ll see what kind of shape Charlottesville, VA is in following the storm but the Ohio game is unlikely to change much opinion about the Cavaliers heading into Week 4’s match-up vs. the Cards. 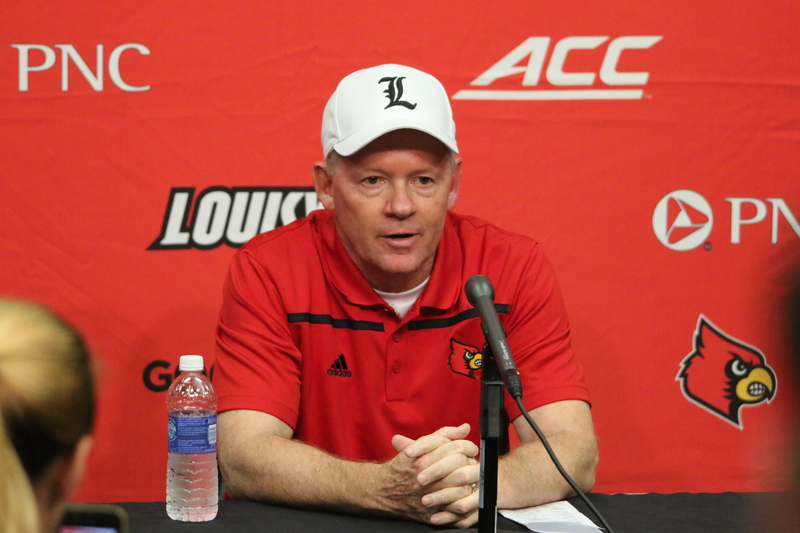 In two ACC trips to Charlottesville the Cards have split with the Cavaliers…. one James Quick dropped punt gave the game to UVA while Louisville needed a 4th quarter drive from Lamar Jackson culminating in a bomb to the endzone to Jaylen Smith to steal the win 2 years ago. Winning in Charlottesville hasn’t come easy for UofL. Lost to Virginia Tech and Beating Samford sounds like things might be going according to plan in Year 1 of Willie Taggart. BUT….. getting beat 24-3 by the Hokies and then having to come from behind to beat the Samford Bulldogs has people in Tallahassee breathing out of a bag. It’s not good right now for the Seminoles with their new head coach. This week FSU travels to the Carrier Dome to face Syracuse who can score points on almost anyone and the Noles will host Northern Illinois before traveling to Louisville. There is still a bunch of time for the Noles to get things going……. but there isn’t THAT much time. The Cards could have a shot at beating Florida State 3 years in a row….. but they better get A LOT better between now and then to make the fans feel good about their chances. The Yellow Jackets smoked Alcorn State and then managed to lose to South Florida despite 602 yards of offense. USF had two different kickoff returns for a TD which skewed the final result, but, GT turned the ball over 3 times as well. Right now the problem for Tech isn’t offense…. it’s special teams and turnovers. This week GT has a chance to get back on track as they travel to Pitt and we SHOULD learn a lot more about this team after Week 3. Lots of offense, but do they do everything else well enough to be a threat? GT also hosts Clemson and Bowling Green before they travel to Louisville for the Friday Night match-up. Boston College had everyone talking this pre-season because they returned Quarterback Anthony Brown & Running Back AJ Dillon…… and so far there’s been good reason to be excited. The Eagles are 3-0 to start the season and 1-0 in conference play after beating Wake Forest on Thursday night. So far they’ve lived up to the hype and Louisville will have to travel TO Boston in the middle of October. The middle of October has been a very vulnerable spot for the Cardinals historically (we’ll have a piece on that as we approach the date). Next week Boston College travels to West Lafayette, IN to face-off vs. Purdue, and then will host Temple and travel to NC State. We’ll have a really good indicator by this point in the season of what BC & Louisville Football is….. but right now this looks like a legit test. Wake has been the source of two surprises thus far in college football. First was opening Week 1 with a much closer than expected win over the Tulane Green Wave and the second was playing Boston College to just a TD on Thursday night. Who is the real Wake Forest? Much of that answer will be determined by the development of Freshman QB Sam Hartman. Hartman has perhaps the biggest receiving weapon in the ACC with Greg Dortch. There is a lot of work left on the schedule before Louisville host the revenge game vs. the Demon Deacons: vs. Notre Dame, vs. Rice, vs. Clemson, and @ Florida State. So Clemson is really good. AGAIN. Last weekend’s win came in College Station, TX versus Texas A&M. The Tigers were saved by the worst rule in football (fumble out of endzone being a touchback) but it appears that Clemson still has that “Clemson luck” and its tough to beat outstanding teams when they get breaks like that. We’ll see just how good A&M is in the coming weeks, but for now we’ll go ahead and say Clemson is Clemson no matter who they play at Quarterback. Also looking at this game almost two months from now who in the world is going to try to match-up with WR Tee Higgins? Syracuse still likes their points and they still appear to be allergic to defense. But whenever a team like the Orange takes the field there is pressure to score and score and score. The Orange are a different team at home (where the Cards will face SU) and they are much different with Quarterback Eric Dungey who was injured the last time the Cards and Orange met at Cardinal Stadium (last home game in rain of 2017). This week Syracuse will host Florida State and we’ll have a much better understanding of who Syracuse is. But regardless, it’s the opinion of most around the country that Louisville should be the better program here. The truth is we don’t really know who NC State is just yet. The Wolfpack struggled against James Madison but then they blew the doors off Georgia State. Unfortunately we won’t get to see NC State play West Virginia this week (thanks Florence) so we’ll have to wait until the subsequent weeks to really know. The general idea is that without Bradley Chubb (who was awesome) the Wolfpack may be re-tooling a bit. But they still have Ryan Finley so we’ll have to wait and see on this future match-up. It has to feel good for the UK program to get the monkey off its back with a win over the Gators. But the week prior the Cats struggled with CMU who turned right around and got throttled by Kansas. Is Florida good? We’ll find out, but regardless all of the sudden UK has confidence in Week 3. UK will beat Murray State this week, and then we’ll get to see how ‘for real’ Kentucky Football is in 2018 with a stretch that includes Mississippi State, South Carolina, Texas A&M, Vandy, Mizzou, Georgia and Tennessee. Long way to go for this one….. and we still haven’t punted.